I took a big step this month toward extending the food I grow. Yesterday I planted my first tree, a Fuyu persimmon. 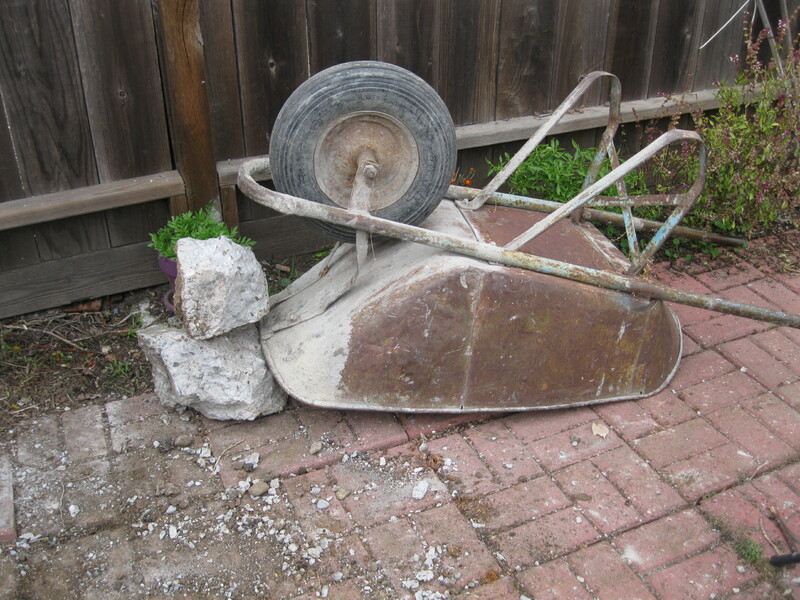 This sounds simple, but it was months of work, from learning about trees and deciding what to put in first to breaking up a concrete slab with a sledge hammer and hauling the concrete out of the planting hole. I bought the tree with a Christmas gift certificate and redeemed another certificate to transport the tree. I relied on the advice of many gardening books, especially Grow a Little Fruit Tree by Ann Ralph. I selected the Fuyu because it is a hardy tree, generally free from diseases, because its foliage turns color in the fall, because I enjoy eating Fuyu persimmons and because we desperately needed a shade tree (our yard had no trees or shrubs) and the summers are hot. It was the best tree I could come up with to provide fruit, foliage and shade. Between me and my desired tree, lay many obstacles, including the stump of a large pepper tree, years of drought and a 50″ x 29″ slab of reinforced concrete. I tried undermining the slab by digging the dirt out from under it, hoping it would break and fall. Then Johnny, who rarely spends time in the yard, decided to discuss my plans with our kind landlord. Richard brought a ten-pound long-handled sledge and set to work. And when he went away he left the hammer leaning against the fence and I took up where he left off, bashing away. One of the more satisfying moments I had was watching the slab crack into three pieces. After hauling chunks of concrete across the yard I began to dig the planting hole. About a foot and a half down I found another chunk of concrete. This is life in my hard-luck yard. My landlord had taken his sledge home and I had only a borrowed one-pound sledge, which felt like a child’s toy after the larger hammer. Naturally, I found the concrete as it was getting dark the evening before I planned to pick up my tree. I wondered if I should delay getting the tree, but I had been working on this for six months and my gut said, “Get it.” I wanted to take advantage of the recent rain. I did not know if I could get the concrete out of the planting hole, but the nursery said I had up to forty-eight hours to plant the tree after I brought it home. Jayzie and I dug and filled and Bryan drew us a level and held the tree straight. After they left, I moved more concrete and rocks, leveled the dirt in the pit, and flipped back all of the pavers I had removed for easier excavation. Then I went in and had a long soaking bath and a hot meal. This morning I was at it again. 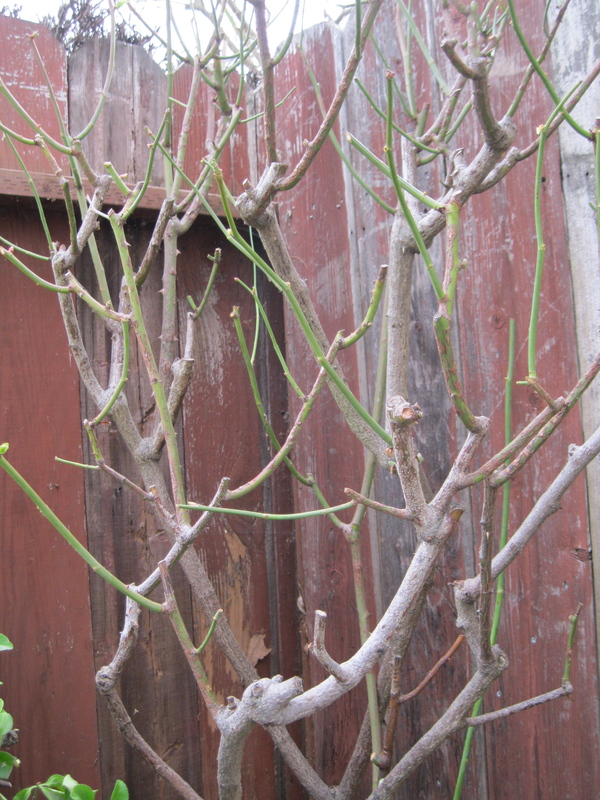 When I went to get my tree yesterday I took a class in rose care and pruning. The cold January day gave me the perfect opportunity to practice on the Sterling Silver rose in the front yard, a tangled mess that had not been properly pruned in years. Our instructor said that roses were forgiving so I took courage and pruned wayward branches, cut away rose hips, clipped yellow leaves. When I could get to the bottom of the plant I took off suckers, cleared away debris, removed the intruding branches of the nearby hedge. I hope the rose will appreciate some air and light. I appreciate all of the help I got to begin my backyard orchard, including Natalie Goldberg’s teachings about great determination. Do I want more trees? Oh yeah. Shrubs, too. Berries, Meyer lemons, Kadota figs, grapes. I could use a few days off from encounters with Basic Concretians, but my birthday is coming up next month and Berkeley Horticultural throws its remaining stock on 30% off sale on March 2nd. Very cool, Sharyn. Your determination will surely pay off in some beautiful fruit, and your initial inspiration to “grow what you eat” opens all sorts of possibility! Thank you, Debra, for your interest and encouragement. I have been stricken with a lust for fruit. In 2017 I acquired a raspberry plant. 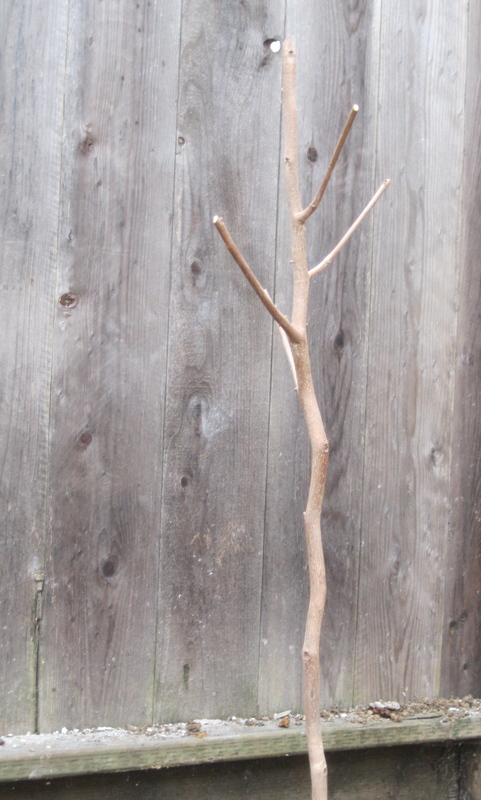 Today I pruned it and transplanted it from its pot into the ground. I also snagged what I think is a wild blackberry cane some months ago and stuck it in the ground beneath some compost and cardboard. It has no leaves yet, but I’m hoping it sprouts some one of these days. Happy planting and hopefully harvesting soon! Thank you. Since I wrote this, I have also planted a Conadria fig.